We care about our place in the world and are working to ensure we are always an ethical and environmentally responsible company. Our operations at Squadkit are a tiny part of this. However, we recognise and embrace the fact that we have an important role to play in ensuring that our industry rises to the challenges it faces and that our own operations have as positive an impact as possible on the world and the people involved. Garment manufacturing is a relatively lower skilled, lower wage industry. It tends to be developed early in the industrialisation cycle, largely employing new workers from labour intensive menial jobs such as subsistence agriculture. As a country develops and the skills and expertise of workers and managers increase, garment production tends to decline. The production skills learned making garments are applied to higher value-added sectors such as electronics and vehicles. Textile production moves on to new countries. However, newly emerging countries tend to have poorly developed regulatory regimes and labour standards. The constant price pressure on retailers creates a tendency to cut corners, creating genuine areas of concern. The solution is not to retreat to sourcing all product in the UK and Europe. There is no guarantee that these factories are not cutting corners of their own and in most product categories we have been unable to find factories who can meet our standards. We see global trade as a fair bargain. We get carefully made, high quality clothes using the best of the world’s fabric technologies, at prices that our customers can afford. In return we pay our suppliers fairly so that they can offer honourable, well-paid employment to their staff and have the opportunity as individuals, businesses and countries to grow and develop. Done well, global trade provides one of the best opportunities to fight poverty and injustice around the globe. We set out to do it well. To achieve this, we believe in working with a small number of suppliers with whom we can build genuine commitment and trust over the long-term. This ensures that we know every part of their business and can be certain that they share and meet our values and high ethical standards. We have ten core suppliers who make over 80% of our goods. Eight of these are overseas. We believe that free and fair trade is an important way to spread wealth around the world. We take our responsibility to improving the welfare of everybody who contributes towards the creation of our garments extremely seriously. All factories producing product for us, wherever they are based, must comply with our Code of Conduct for Suppliers. 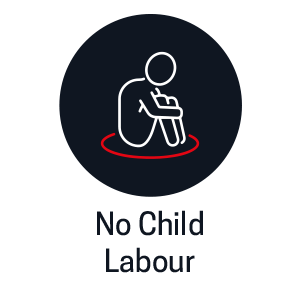 Schoolblazer’s Code of Conduct for Suppliers follows the guidelines set by the ILO (International Labour Organization)2 and the ETI (Ethical Trading Initiative)3, but works to a higher standard on child labour (we have absolutely zero tolerance; the ETI standards “work towards elimination”). We are working to build an environmentally responsible and sustainable business. The biggest single polluting factor in the garment industry is society’s demand for cheap, disposable clothing. According to the WWF, even a simple cotton T shirt takes almost 3,000 litres of water to produce4 and the carbon content of a typical garment is around 11Kg5. We have committed ourselves to finding a better way. The best way to reduce the environmental impact from clothing is to manufacture fewer things and ensure that each item will last6. The average fashion garment is worn just 7 times before being discarded7. In contrast we design all of our garments to be worn over 100 times and last for at least 2 years. This requires a clear and stringent approach to textile development, garment testing and quality control, but minimises the total cost for the planet and our customers. We have adopted four core initiatives to ensure that the items we produce under our Squadkit brand minimises our environmental impact. We know we could do more and plan to add more initiatives over time, but we are a small part of a giant industry. These initiatives let us make the biggest impact quickly and help us drive wider industry change.